This topic comes up now as we are in contact with Jacob Adoram who is rowing his custom build Emerson non-stop from Neah Bay, WA to Cairns, AU, with the longest unassisted ocean rowing record on the horizon. He has just passed HI (within smelling distance) after 5 months of rowing and is now headed SW towards Cairns, just over 4,000 miles off. His next navigational challenge is crossing the equatorial current systems, and in particular the countercurrent that takes him the wrong direction. All small craft must navigate these currents when crossing the equator, but this is particularly of interest in a vessel whose average speed is rather slower than a leisurely walking pace. But with this challenge comes a unique opportunity to learn something about these currents that could benefit other mariners. He can periodically stop rowing and measure the current set and drift and we can compare that with readily available predictions, namely the RTOFS model and the OSCAR analysis of the average flow, plus our basic fall back, the climatic averages presented on the monthly US Pilot Charts. We can also look at the HI regional NCOM predictions down to Lat 15 N. We are just getting started on this project, but it is already proving valuable. To explain that we need a bit of background. The average ocean current, worldwide at a random place and time is about 0.6 kts and is frankly more or less in a random direction. In specific locations the currents are notably stronger and more predictable. The Gulf Stream and its Pacific counterpart the Kuroshiro are just two examples. Figure 1 shows the general global circulation in the Atlantic and Pacific. 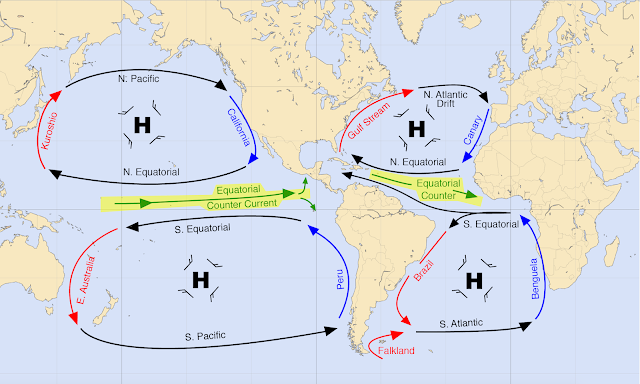 These currents are essentially wind driven currents that follow the climatic prevailing flow of the winds around the ocean basins, as shown schematically with the symbols of a mid ocean High. Figure 1. Average surface current circulation following prevailing winds. The Highs (H) are schematic and seasonal, and often transient and moving. But the average circulation of the winds and currents are clockwise around the northern oceans and counterclockwise in the southern oceans. There are similar patterns in the Indian Oceans, but they are more complex. Both winds and currents are weak in the centers of the oceans on average and strongest along the boundaries. The equatorial currents flowing west in both oceans pile up water on the western boundary that returns back to the east as a countercurrent—sometimes below the surface, and sometimes at the surface. 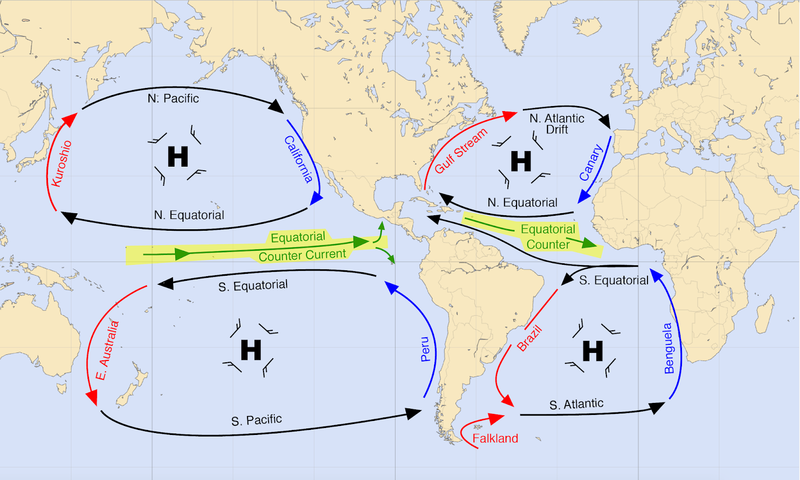 The equatorial currents are largely driven by the trade winds as shown in Figure 2. The countercurrent tends to return in the doldrums between the two trade wind belts where there is no wind resisting it. Figure 2. Countercurrent located in the doldrums (ITCZ) between the trades. The location of the doldrums and countercurrent (CC) varies somewhat with the season, but it's always north of the equator, between about 5º N and 15º N. The speeds of the currents also vary somewhat, as shown in Figure 3. Figure 3. 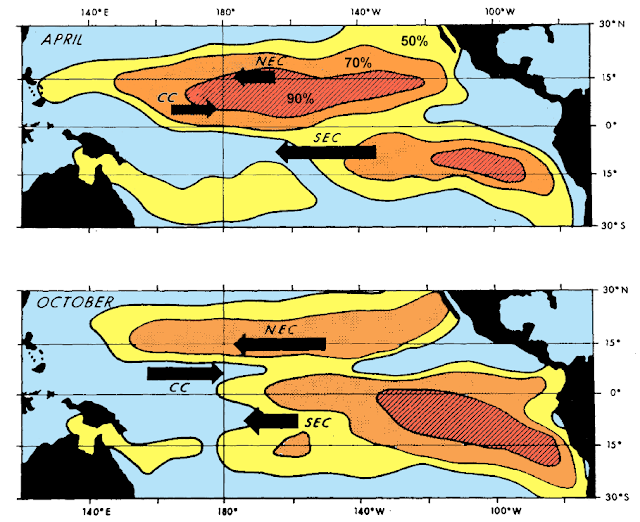 Pacific Ocean locations and relative strengths of the North and South equatorial currents (NEC, SEC) and the countercurrents (CC) between them, overlaid onto a depiction of the dependability of the trade winds marked as percentage of times the winds are from the E to NE with speeds above 6 kts. The patterns of trade wind stability are notable to navigators in their own right. We can correlate this research data with the Pilot Charts, which are readily available to mariners either as pdf documents or as actual RNC nautical charts. Samples below are for April. Figure 4. Sections of Pilot charts for April. This is N. Pac. (currents in knots) overlaid on S. Pac. (currents in nmi/day). The red line is the rhumb line from his Hawaii passing position to Cairns, AU. 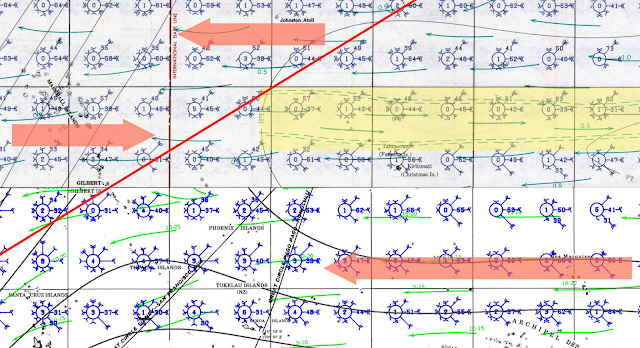 Large red arrows are transferred in place from the early research paper, Figure 3. Below we zoom into the region of the CC for a better comparison with the early study. Figure 5. Close up of Figure 4. In April, the Pacific CC is most notable in the range of 170W to 130W with a speed of about 0.5 kts, but this is just the average of all Aprils, which is roughly the same speed as the NEC flowing the other direction, 0.5 to 1.0. Note that not all arrows are labeled on Pilot Charts, and some arrows of the same length have different speed labels. They are not scaled. As a guideline, we can think of these currents as ± 50%, i.e., 1 kt = 0.5 to 1.0, 2 kts = 1.0 to 3.0. And frankly, when it comes to the countercurrent, without further information such as a recent model forecast or OSCAR prediction, it is worse than that. The counter flow could be missing completely, so an anticipated 1.0 kt to the east based on the Pilot Chart could present you with 1.0 kt to the west. That knowledge gets to go into our emergency navigation planning (i.e., when no other info is available), but these days, with our full complement of resources at hand, we can do much better, because we have ocean model forecasts that are tied to measured SST and sea surface heights, along with known present wind conditions. These models can also take into account the vertical profile of ocean properties and address this current flowing east at the surface versus deeper down where it would not affect navigation. With that brief background behind us, the subject of this note is the application of these ocean current resources, meaning when and where we get them, and how they compare. Then our own next goal is to try to evaluate the various forecasts using actual measurements from an ocean row boat slowly crossing the full current pattern, north to south. We concentrate the examples on the Central Pacific in Jan and Feb, as Jacob Adoram approaches these currents now in real time. Soon we will have other links to show live data, updated on a daily basis. We start with the NGA Pilot Charts, which as noted we can get as PDF files, or as georeferenced RNC (.kap) for use in any echart program. We view the latter in the free program OpenCPN. These can easily overlay North and South Pacific Charts (quilting on), which can in turn be zoomed and overlaid with navigation routes or wind and current forecasts in GRIB format. Below is a sample. Figure 6. Section of a January Pilot Chart viewed in OpenCPN. 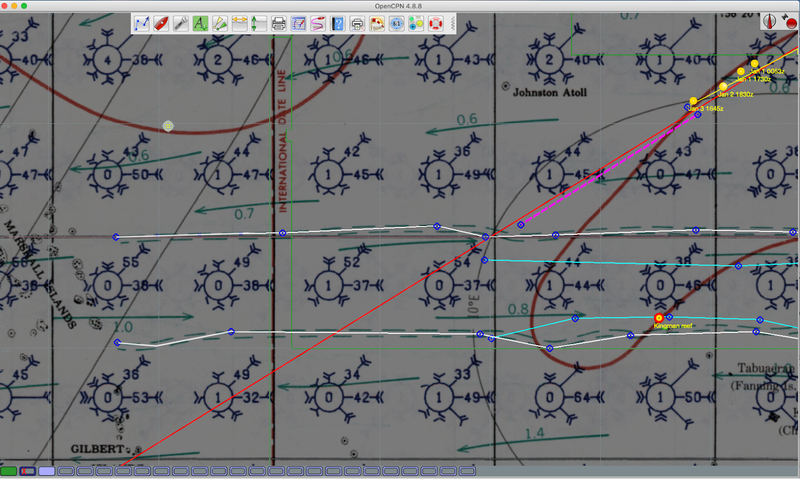 The red line in Figure 6 is the rhumb line route to Cairns from HI (4, 054 nmi @ 240T). The dotted magenta line is a 16 day estimated position based on 35 nmi/day (1.5 kts). It provides a rough 2-week or so look ahead at coming conditions. He has done twice that average speed recently, but the average since July across the North Pacific was notably slower than that. We use a 16-day run as that is the extent of the GFS forecast. We are well aware that this is wishful thinking on forecasts beyond 5 days or so, but maybe not totally delusional within the trades. We are using the FV3 GFS forecasts available from LuckGrib, which is appearing to be notably better than the standard GFS in common use. The turquoise lines are outlining the limits of the countercurrent in January, which can be seen on the green arrows is about 0.5 kts. They also show that in January as well as April the CC does not firm up west of about 170W, which is where the turquoise lines end. The white lines mark the same boundaries in February, where we see that climatically this countercurrent firms up farther west. This is shown in Figure 7 below. 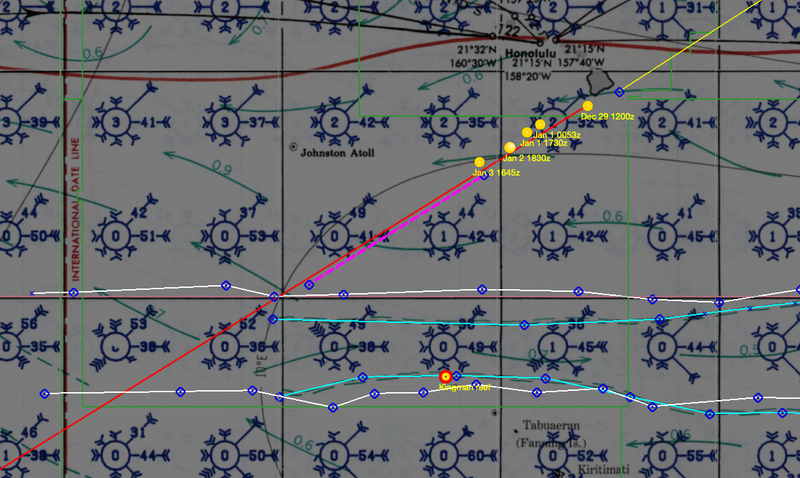 These lines were added as routes following the Pilot Chart current bands. Figure 7. February Pilot chart showing countercurrent extending farther west and stronger than in January. The red and yellow dot marks an isolated reef, remotely in range. This February pattern is more what he might expect when he gets there. The countercurrent is estimated to be about 1 kt spread over a 280 nmi wide band, right across his route. We should get good measured data on this current in a few weeks. That is then the climatic background we use to look at the modern model forecasts, but before getting to that, a couple notes. We have so far from Jacob three drift measurements made up where the yellow position reports are shown in these figures, and in each one of these the measured set and drift was almost identical to what was predicted in the January Pilot Chart. Next, looking at Figure 7, we see that our goal is to progress diagonally across a steady current band crossing our path as shown. If we suppose we have a fixed maximum speed, but we can choose any course we wish, what would be the most efficient (fastest) route across this current. In other words, do you crab across to maintain the intended course line, or maintain the course heading and get set, or head perpendicular to the current and get set more, and so on. This is a fair navigation question, whose right answer depends on several factors, but that is not the main topic at hand. For now we are just investigating our best sources to anticipate where this current will be and how strong will it be when we get to that region. The ocean model that is most popular for sailors and indeed all mariners is the Real-Time Ocean Forecast System (RTOFS), which is NCEP model produced in collaboration with the US Navy. This is most popular because it has been available in GRIB format for a long time and almost every navigation program has a direct link to it, and it is indeed a global model used internationally. The model is updated once a day and extends out 4.5 days. The resolution is 5 nmi (0.083º). The other current model we can look at is the Ocean Surface Current Analysis Real-time (OSCAR). This analysis of the ocean currents is carried out here in Seattle. It is a direct computation of global surface currents using satellite measurements of sea surface height, wind, and temperature. It is in that sense more of a direct look at the current flow, but it is not a forecasting tool. It is a sliding average of the current over the past 10 days which is issued every 5 days. Because there is so many eddies and meandering of the actual surface flow at any one time at random places in the ocean, this OSCAR average tends to give lower current speeds than might be expected, except possibly in areas of more steady currents such as the Gulf Stream or the Equatorial currents we care about for now. 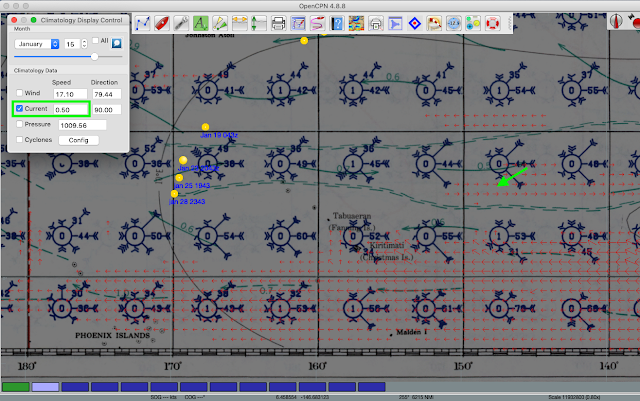 Below we see the climatic OSCAR data from 1992 to 2012 displayed in the navigation program OpenCPN using the Climatology Plugin. 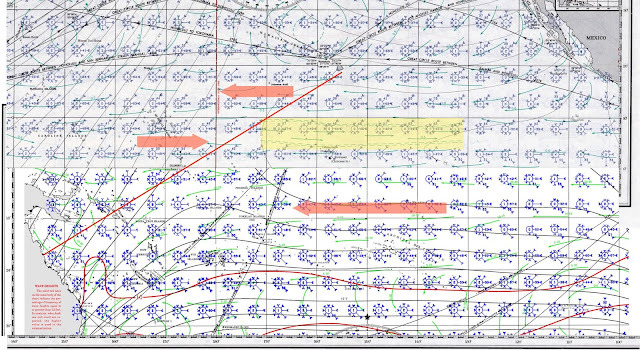 There is not much data for Jan, but we do see rough agreement with the Pilot Charts. Figure 8. Average OSCAR currents for Jan displayed in the Climatology Plugin of OpenCPN compared to the Jan Pilot Chart. We note that the Pilot chart calls for notably different countercurrent distribution for Feb, but this is not reflected in the Climatic OSCAR data. We were working on this in the end of December, at which time Jacob was well north of the countercurrent band and we had plenty of interesting OSCAR data. Then the government shut down, and for some reason so did the OSCAR current determinations. Now is it Jan 24 and still no OSCAR currents and at the same time Jacob is well into the countercurrent band, and indeed there is some indication he is being set to the east. The government shutdown is in principle over, so we will see if the OSCAR currents return. I will update this note shortly with a video link.